Note: There are special instructions for managing macOS Installers, and Adobe Updaters and Installers for CS3 or CS4. 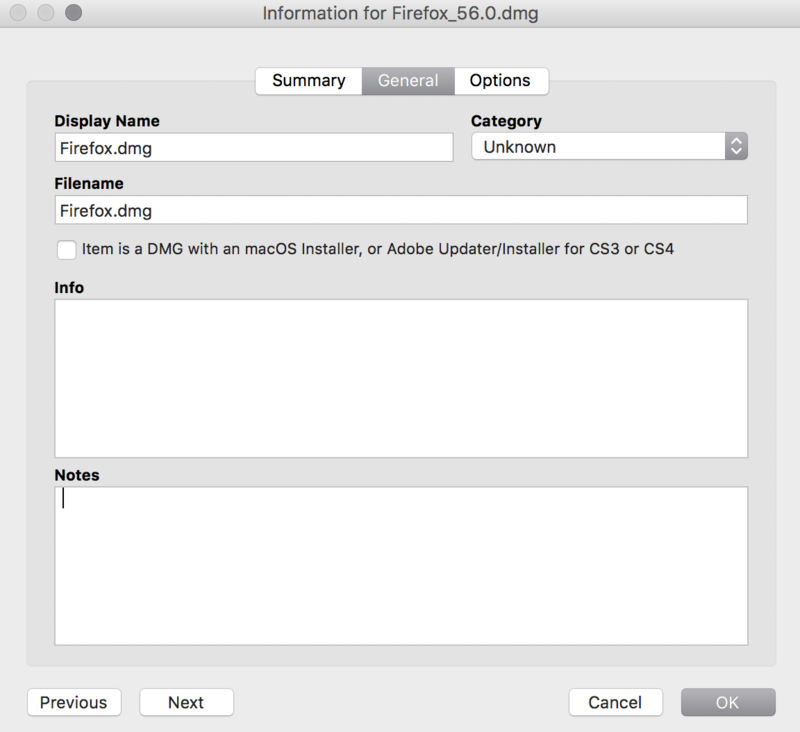 For more information, see Managing macOS Installers or Administering Adobe CS3 and CS4. Add the package to Jamf Admin—This method adds the package to the master distribution point and Jamf Pro. You can then add the package to other distribution points via replication. Upload the package directly to Jamf Pro—This method is only available if your master distribution point is the cloud distribution point. It adds the package to the master distribution point and Jamf Pro. You can then add the package to other distribution points via replication. Manually—This method is only available if your master distribution point is a file share distribution point. It involves manually copying the package to the distribution point and then entering information about the package in Jamf Pro. Add the package to a category. For more information, see Categories. Choose a priority for deploying or uninstalling the package. Fill user templates with the contents of the home directory in the package’s Users folder. Fill existing user home directories with the contents of the home directory in the package’s Users folder. Allow the package to be uninstalled. Specify whether computers must be restarted after installing the package. 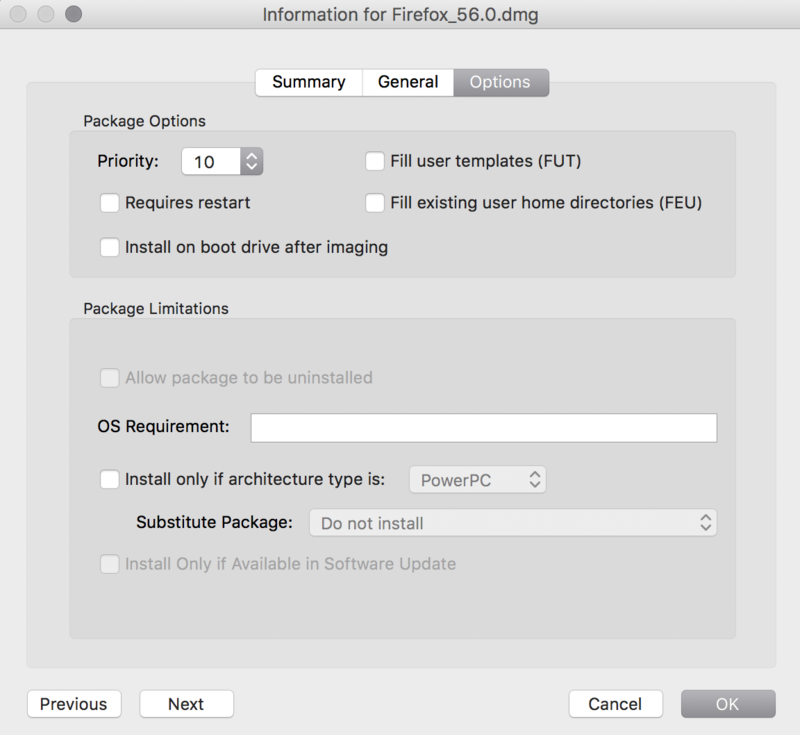 Choose whether the package must be installed on the boot drive after imaging. Specify operating system and architecture type requirements for deploying the package. Only allow the package to be installed if it is available in Software Update. You can also index packages. Indexing creates a log of all the files contained within a package. This allows you to uninstall the package and view the contents of the package from Jamf Pro. Packages can only be indexed using Jamf Admin. In addition, you can validate packages using the checksum. For more information, see Calculating a Checksum. When you add, edit, or delete a package in Jamf Admin, the changes are reflected in Jamf Pro and vice versa. To manage packages, you need a distribution point set up in Jamf Pro. For more information, see About Distribution Points. Adding a package to Jamf Admin automatically adds the package to the master distribution point and Jamf Pro. Drag the package to the main repository in Jamf Admin. The package is displayed in blue text in the Unknown category until you add it to a category. Click the General tab and configure basic settings for the package, including the display name and category. Click the Options tab and configure additional settings for the package, including the priority, and operating system and architecture type requirements. Note: Package Limitations options do not apply when installing a package during imaging. If your master distribution point is the cloud distribution point, you can upload the package directly to Jamf Pro. This adds the package to the master distribution point and Jamf Pro. In the “Computer Management” section, click Packages . Use the General pane to configure basic settings for the package, including the display name and category. Note: If you do not add the package to a category, Jamf Admin displays the package in blue text in the Unknown category. Click Upload Package and upload the package. Click the Options tab and configure additional settings for the package, including the priority. (Optional) Click the Limitations tab and configure limitations for the package, including operating system and architecture type requirements. If your master distribution point is a file share distribution point, you can manually copy a package to the distribution point and then enter information about the package in Jamf Pro. Copy the package to the Packages folder at the root of the file share on the distribution point. Use the General pane to configure basic settings for the package, including the display name, category, and filename. Click the Options tab and additional settings for the package, including the priority. In the main repository, select the package you want to edit or delete. To edit the package, double-click it and make changes as needed. Click OK. Then click File > Save. To delete the package, click Delete and then click Delete again to confirm. The edit or delete action is applied immediately on the master distribution point. The action is applied to your other distribution points when replication occurs. Indexing a package creates a log of all the files contained within the package. This allows you to uninstall the package and view the contents of the package from Jamf Pro. Packages can be indexed using Jamf Admin only. The time it takes to index a package depends on the amount of data in the package. In the main repository, select the package you want to index and click Index at the bottom of the pane. When the indexing process is complete, Jamf Admin defaults back to the main repository. Click the package you want to view the contents of. A table that contains the package contents is displayed. The checksum is calculated when a package is uploaded to Jamf Pro. The checksum ensures authenticity when the package is downloaded. In the main repository, select the package you want to calculate checksum for. Control-click (or right-click) and select Calculate Selected Package Checksum(s). Find out how to install packages using a policy or Jamf Remote. Find out how to cache packages using a policy or Jamf Remote. Find out how to install packages that were cached using Jamf Pro. Find out how to uninstall packages that were installed using Jamf Pro.